Android 4.0 (Ice Cream Sandwich) integrates fully contacts and calendar support (unlike previous versions) so other application can flawlessly work with contacts and calendar. 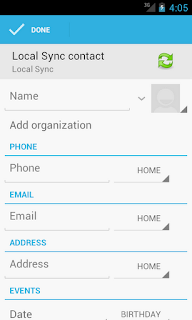 In case of Local Sync application it means for example, that it is possible to create Local Sync account and Android built in contacts application offers to add/edit only fields that are synchronized with Outlook. So there is no need for 3rd party contacts/calendar applications or databases. Local Sync exploits internal Android 4 databases fully so all data are in the right place. Local Sync calendar is created after first synchronization (name if the calendar is email address of default Outlook account). Do not forget to create contacts and appointments in correct account, because indeed only contacts from Local Sync account and appointments from Local Sync calendars are synchronized with Outlook via Local Sync application.